This booklet published in Spring 1982. At this time it was thought that the eastern terminal of the DLR would be Mile End - not Stratford. Each item of ephemera may be viewed in PDF format by clicking on the thumbnail image. To read the text zoom the view to about 150%. The Beckton extension was being discussed years before the initial DLR system was opened. This booklet and questionnaire dates from July 1984. This information booklet gives notice of a series of public consultations, in October 1985, to decide the route of the Beckton extension. Clearly the DLR builders did not want the route that they were eventually forced to take. This leaflet dated March 1987, was one of many warning parents to stop children trespassing on the railway after the current was switched on. An early (1986) leaflet warning of the dangers of children trespassing on the railway. Another early (1986) leaflet warning of the dangers of children trespassing on the railway. The map still shows ‘Carmen Street’ station. This was never built and has now been superceded by Langdon Park Station. 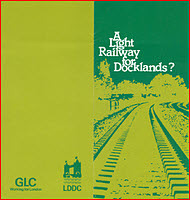 A warning leaflet distributed following the DLR going ‘Live’ in August 1986. The operations booklet distributed to staff giving precise details for the Royal Opening by Her Majesty Queen Elizabeth II. Official Site Pass and Souvenir Ticket from the Royal Opening Day. First Day Cover for the Royal Opening incorporating a DLR ticket and a DLR postcard. This leaflet dating (presumably) from 1987 introduces the new railway to the public. A public information leaflet from around the period of opening in 1987. First Day Cover for the Public Opening incorporating a DLR ticket and a DLR postcard. Three foldout booklets on card giving the history of the area that the new railway passes through. 1) Tower Gateway to West India Quay. 2) West India Quay to island Gardens. 3) West India Quay to Stratford. 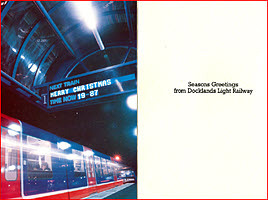 A “Seasons Greetings” card for 1987 from the DLR.